Jim answers the phone. A scary voice tells him a bomb has been planted under the house and it'll go off in ten minutes. 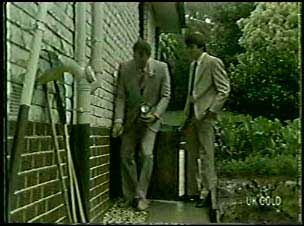 Jim asks Danny to nip next door and tell his father not to bring Terry across quite yet. Meanwhile he goes off with Scott to investigate. Shane and Paul chat and Shane assures him that he won't lose the rings. Paul is very nervous. Jim and Scott have crawled under the house to have a look. Scott thinks it must be a hoax, but Jim isn't so sure - Terry was married to a nutter, after all. Julie thinks Danny is joking with them, saying Terry has to get to the wedding on time. Terry is dressed in a nice white-ish dress, and Lucy is in a blue flowergirl dress. Julie goes out to the garden with some rubbish, and we get a brief glimpse of the wreath which is in the bin. Jim and Scott are looking for something suspicious. Suddenly Scott finds something. Helen rings Julie to ask what the hold-up is. Julie says they'll come across soon, but agrees with Danny that she'll wait for Max. Scott asks Jim if they should call the bomb squad. But Jim thinks it's a practical joke. He picks up the alarm clock and finds it isn't wired to anything. Jim, Terry and Lucy have arrived, and so have Jim and Scott, brushing dust off themselves. Helen reads from a book belonging to Anne. HELEN: These simple words meant so much to her in her marriage. I'd like to repeat some of them today. Above all other emotions one's experienced, love never fades away. Love has no barriers, makes no judgement. Love is unlimited, except for the limitations you place upon it. And marriage is the certain commitment of lovingly sharing oneself with another. It is also loving the commitment you have made for yourself with a partner. So be as joyous in your marriage as you are now. Only then will you lovingly and radiantly make your marriage grow into an abundant and prosperous life. Their love grows into a joyous celebration of life itself. Paul hugs Helen while an elderly relative asks loudly what they are mumbling about(!) Everyone shushes her! 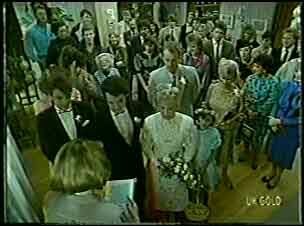 The celebrant takes Paul and Terry through their vows while we see both Des and Julie looking sad. 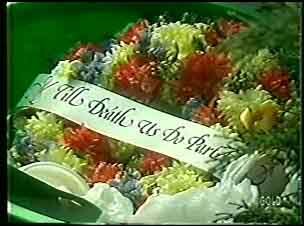 As Terry says her vows, we see a close up of the wreath in Des's bin with a label, "Till Death Us Do Part". 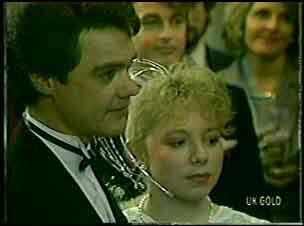 Paul and Terry exchange rings and are declared to be husband and wife. Everyone cheers. The wreath still sits in the bin. 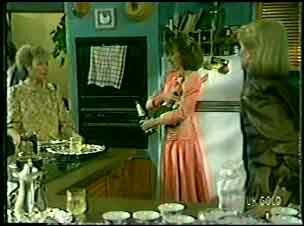 Later, in the kitchen, Helen asks Jim if he thinks Paul will be happy - she hopes they will. Just then, Gwen comes in and offers her help. Helen walks off immediately. Gwen asks Jim what Helen is really like - they haven't spoken in years. Gwen was touched by Helen's reading of the book at the wedding. Jim says if Helen hadn't stepped in when Anne died, he doesn't know what would have happened to the family. He says that Helen has great compassion. 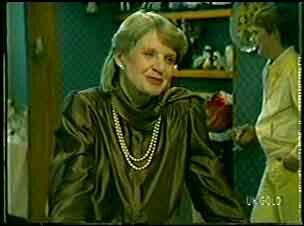 Gwen wishes she and Helen could forget their differences - what Gwen did to Helen. Eileen is talking loudly to the deaf elderly relative, about Des being jilted at the altar(!) Eileen explains that the elderly relative, Daisy, is Jim's aunt. Julie comes to talk to Aunty Gwen who is doing the dishes. Gwen thanks Julie for inviting her. Just then, Helen comes in and Gwen calls her over. She asks her to have lunch with her tomorrow. HELEN: I'm sorry, Gwen, I'm busy tomorrow. LUCY: Shane? If you're the best man, how come Terry didn't marry you?! Scott and Danny are preparing to attach cans and decorations to the car. 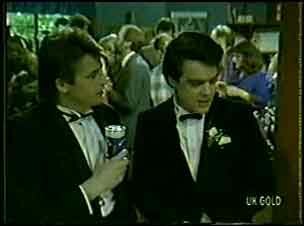 Danny asks Scott why the wedding was held up, but he doesn't tell him. Danny says he didn't enjoy the wedding - "love and honour" is a joke. He's clearly upset about Maria going to Hong Kong with Richard. He's happy to stay with Max though. 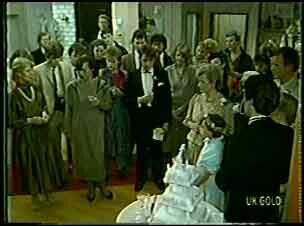 Paul and Terry cut the cake and Shane reads the telegrams. The first one from Nana Robinson, one from the Taylor family, one from Nick Berman, one from Doug and Brad. Finally there's one from "Charles" who is "looking forward to meeting Terry's husband and sends his love". Terry says that Charles is a friend of hers and scary music plays. Finally, Shane wishes Terry and Paul love, happiness, and lots of children on behalf of everyone. They all toast the bride and groom. Max is skulking about looking upset. Jim tells Paul and Terry that if they ever need anything, they should come straight to them. He says he's bought the Sutton's house up the street, and Paul and Terry can live there rent-free for three months. Paul is very, very pleased. He thanks everyone for making it such a lovely day for them. In particular, he wants to thank Terry. And also his grandmother, Helen, for everything she's done to bring up the kids since his mum died. He also pays tribute to Aunt Gwen for coming today. 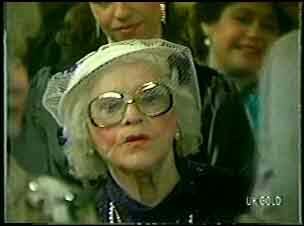 Aunt Gwen pipes up and says how happy she has been to renew old family acquaintances. She tells Helen that everyone loves her so much, but she has one more thing to say. She tells everyone the story of how she got Helen expelled for stealing when they were children. She starts to cry and tells Helen how sorry she is. GWEN: Please, can't we forget it? After all, we're about the only two now who even remember it. Forgive me? Slowly Helen reaches out her hand to Gwen and shakes it.